“Waste is considered a sector that will pose particular challenge for the candidate countries in this regard because of the extent of the EU environmental requirements and the need for significant investment in environmental infrastructure in order to achieve compliance. Therefore, waste management represents one of the key challenges in the process of alignment and special efforts will be focused on resolving all the problems in this area. Basic principles of waste management that EU waste management is based on, even though integrated in the National Waste Management Strategy and National Plan for Waste Management, are still not fully applied in the system of waste management in Montenegro, particularly when it comes to the hierarchy principle which ensures compliance with the order of priorities in waste management (prevention of waste creation, preparation for re-use, recycling and other recovery operations (use of energy) and waste disposal). Systems for separate collection of municipal waste are not still established at a satisfactory level. The largest economic activity generating waste in Montenegro is construction and demolition with 37% of the total waste generated. (according to the EuroStats). Municipal waste (also known as solid domestic waste or household waste) which accounts for about 13 % of total waste generated in Montenegro has a very high political profile because of its complex character, due to its composition, its distribution among many sources of waste, and its link to consumption patterns. Zero Waste Montenegro has chosen to focus on Municipal Waste due toits limited capacity. As our NGO grows, we plan to expand our scope of work to construction and demolition waste as well. Municipal waste production: It is difficult to give exact numbers as not all municipalities know exactly how much waste is produced in their municipality, as not all of it is collected. According to extrapolation of official data provided by the Ministry of SD&T, there would be about 160.000 tons produced per year so about 250 kg per person per year (data: 2017). But those data don’t usually include waste dumped illegally. According to MONSAT, the statistical office, there was in 2013 approximately 230 000 tons of municipal waste generated annually in Montenegro (so 370 kg generated per person) – and approximately 145 000 tons of biodegradable waste. According to EuroStat 508 kg per person were generated in 2013 in Montenegro, among which 451 kg are treated. So as an average of existing data, we could estimate the domestic waste production per inhabitant in Montenegro (data: 2013) to 400-440 kg. In comparison, according to EuroStat, each person in the EU generated 475 kg of municipal waste in 2014 (and 483 kg of municipal waste in 2016). Waste collection: Montenegro is a small country (650.000 people) with 23 municipalities divided in 3 main regions. There are 155 small unregulated landfills/dumpsites (under 100 m3) 68 medium unregulated dump sites (under 100-1000 m3) and 50 bigger than 1000 m3 across the country. Approximately 60% of total waste collected in the country end up in those unregulated landfills. According to data provided by the Ministry of SD&T, national targets of waste collection for 2017 are between 65% to 95% depending on the municipalities. The municipalities (LSGU’s) are responsible to manage/run the entire process of collection and disposal of waste including levy of a fee to cover all costs. To do this they usually set up an entity (PUC = Public Utility Company). The issues that most are facing, is that they lack administration skills (how to determine the fee to charge households and companies), efficiency (how to optimize resources), they also lack enforcement resources and they lack the ability to chase debt (in fact this is a major issue). There also does not appear to be any collaboration between LSGU’s, not even resource sharing (it appears some councils have extra unused capacity while others lack it….hence in some areas empty bins are collected and in other areas bins overflow). Waste infrastructure: The waste management infrastructure in Montenegro is still under developed. Its development is part of the new National Solid Waste Management Plan. There are currently 9 recycling yards (6 in Podgorica, 1 in Herceg Novi and 1 in Kotor), 4 material sorting facilities (in Podgorica, Zabjlak, Kotor and Herceg Novi), and 2 sanitary landfills (in Podgorica (Livade) and Ulcinj Municipality (Mozura). According to the last Strategic Master Plan for Waste Management it was planned to construct regional landfills in Kotor, Niksic, Berane, Bijelo Polje, Pljevlja Herceg Novi (approximately 70 million euros). The government has announced its new plan in May 2018: it will consists of operating 4 waste management centers (Podgorica, Nikšić, Bijelo Polje and Bar) giving them the choice of having a Recycling Center (MRF Plant) and/or a waste treatment plant for separate and controlled disposal of construction waste, and/or a waste heat treatment plant and/or a sanitary landfill. The choice is being left to each waste management center to select the most appropriate solution depending on their needs and their budget. Waste recycling: Currently less than 2-3% of Montenegro’s waste are recycled. The goal set in the National Solid Waste Management Plan for 2017 was 25% and for 2020 is 50%. The current objective is to increase recycling in all municipalities as much as possible, regardless of the set goal. Municipalities have set their target for 2017 between 0.8% and 8% of waste recycled/waste produced, with more than half with only 0.8%. According to EuroStat, only 1% of municipal waste was recycled and 0% was composted in 2013 in Montenegro. 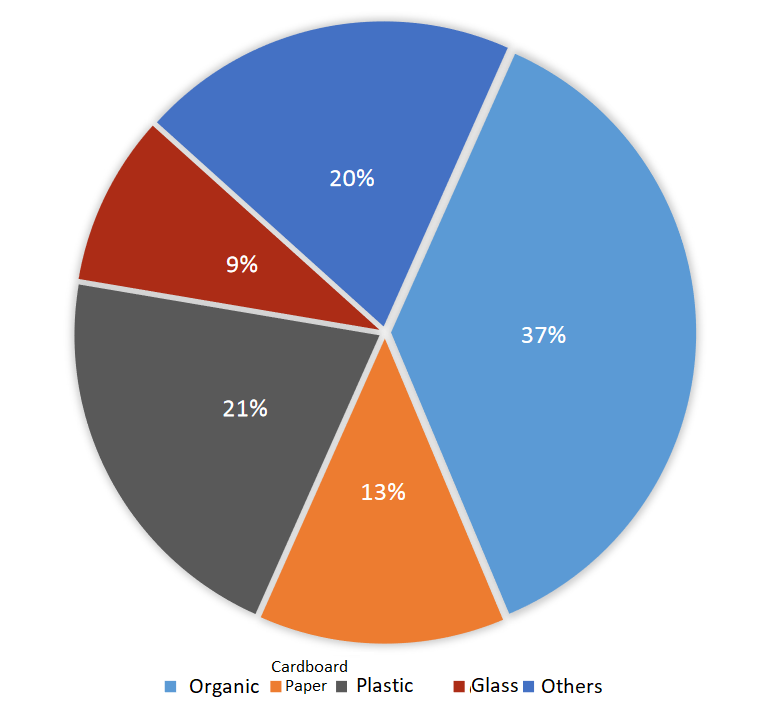 44% of municipal waste in 2014 was recycled or composted. In 2016, 29 % was recycled. Five staff is employed in MSDT. 6 ecological inspectors are employed in AIA. Their competences cover all the issues relating to environmental protection in all sub-sectors, including sub-sector of waste management. Inspection supervision for certain types of waste could include market, mining, veterinary, phytosanitary, forestry, electricity and traffic inspection. Regulation on the criteria for the cessation of the status of iron, steel, aluminium, copper and glass waste (Official Gazette of Montenegro 26/17). Spatial Plan of Montenegro (from 2008). Update January 2017: Montenegro is currently waiting for the decision of the Ministry of Tourism and Sustainable Development regarding the 3 proposed options presented in the National Waste Management Plan: all 3 options have in common a vast majority of waste management infrastructures around the country (5 transfer stations, 3 MRF, 4 composting facilities, 5 sorting centers). Update October 2017: Decision on which option will be chosen by Montenegrin Government which should have been announced in June 2017 is still unknown. A feasibility study for option 3 is still ongoing at the Ministry of Sustainable Development. Update May 2018: The government has finally announced its decision: it will consists of operating 4 waste management centers (Podgorica, Nikšić, Bijelo Polje and Bar) giving them the choice of having a Recycling Center (MRF Plant) and/or a waste treatment plant for separate and controlled disposal of construction waste, and/or a waste heat treatment plant and/or a sanitary landfill. The choice is being left to each waste management center to select the most appropriate solution depending on their needs and their budget.